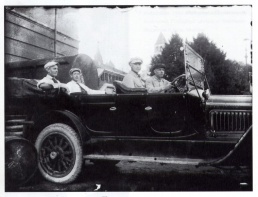 Karl Ioganson, Voldemars Andersons, Karlis Veidemanis and Gustav Klutsis pose in Lenin's Model T Ford at the Kremlin, Summer 1918. All four artists were members of a detachment of Latvian machine gunners appointed to guard the Kremlin after Lenin's transfer of the Russian capital to Moscow in March 1918. 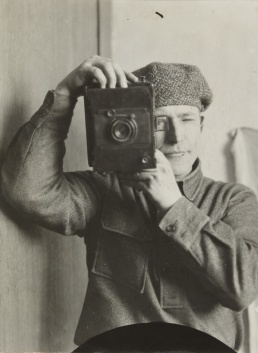 Gustav Klutsis (Gustavs Klucis, Густав Густавович Клуцис; 1895–1938) was a Constructivist avant-garde artist and photographer. A Latvian subject of the Russian empire, Gustav Klutsis came to Russia proper during the 1917 Revolution as part of a volunteer machine-gunner unit that helped to topple the czar and safeguard the new Soviet leaders, including Vladimir Lenin. Klutsis had studied painting at home and continued in art schools during and after his military service, ending up at the radically progressive Higher State Artistic and Technical Workshops (VKhUTEMAS)—the cradle of Constructivism. 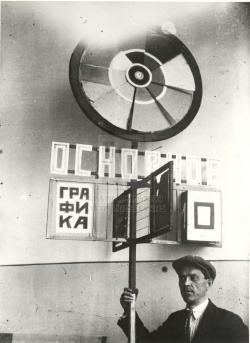 By the early 1920s, Klutsis had worked his way through the rigorous exploration of elemental shapes and basic materials called for by that movement and began to put the Constructivist ethos of honesty and utility to use in agitational propaganda. His designs for mobile poster stands and broadcasting towers (mostly unrealized) to be used for the fifth anniversary of the Revolution were succeeded by years of press illustrations in the rapidly developing idiom of photomontage. Klutsis adopted photography as a means of reinvesting advanced art with what he called “ideologically rich subject matter” that a mass audience would find instantly identifiable and compelling. Hanging Construction, 1921. Photograph, 20,1x25,6 cm, printed from Klutsis's negative. Costakis. Vertical Construction, 1921. Photograph, 20,5x25,2 cm, printed from Klutsis's negative. Dimensions unknown. Costakis. Construction, 1921. Linocut on paper, 21,5x14,2 cm. Costakis. Skyscraper, 1922. Cover design for A. Kruchenykh's Four Phonetic Novels [Chetyre foneticheskikh romana]. Lithograph. 19,7x15 cm. Costakis. Construction, 1922-23. Lithograph on paper, 15,5x22,1 cm. Costakis. Dynamic City, 1919. Photomontage with photographic cuts, foil, gouache and pencil on paper. 37.6 x 25.8 cm. Riga, MoMA. Design for a poster entitled The Electrification of the Entire Country [Электрификация всей страны], 1920. Photograph, 25,2 x 20,1 cm. Costakis. Ekran. Design for Screen, Rostrum and Propaganda Stand, 1922. drawing, 34,7x19 cm. Costakis. Uniform design, 1922. Drawing, 24,1x15,4 cm. Costakis. Dynamic City, 1923. Lithograph on paper, 24,8x18,1 cm. Costakis, MoMA, Artic. The Situation of the Proletariat in the USSR Gets Better and Better, Soviet Pavilion, International Press Exhibition, Cologne, 1928. This page was last modified on 26 January 2019, at 12:57. This page has been accessed 15,846 times.